I always love to watch the trailers when I go to the movies. A well made trailer hits all the right notes, builds suspense and, if it’s done well, makes you greatly anticipate the flick in question. Or, in this case, the book in question, that being my new cookbook – The Harvest Baker. 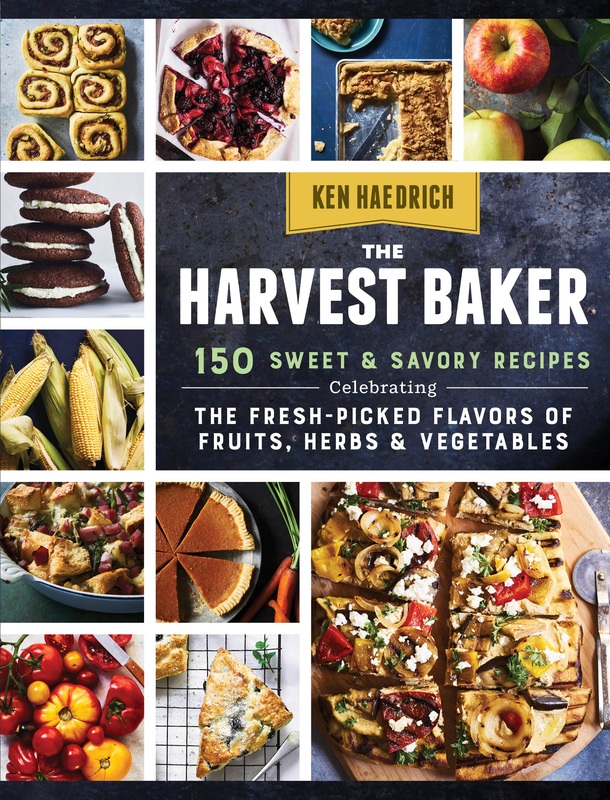 I can’t promise you’ll be sitting on the edge of your seat when you watch the trailer for The Harvest Baker, but I really do hope it whets your appetite and makes you excited to bake from the book. If so, I hope you’ll get a copy from your favorite bookseller or from us at The Pie Academy, if you’d like an autographed copy. We’re still running our special three bucks a book on shipping (plus the cover price of $19.95). To get this special rate, don’t order from our online store (though you can read more about the book there). Instead, send us an email, tell us how many copies you’d like and whom they’re for so we can inscribe them, and we’ll bill you through PayPal (or you can send us a check.) Incidentally, this deal applies to all books right now, and you can view them in our store. Finally, please share this post and this video on social media and with everyone you know who loves to bake. I need your help to spread the word. The Harvest Baker is a real labor of love and I think it’s going to resonate with a lot of cooks like us, who love to bake and also love using fresh fruits, vegetables and herbs. Thanks so much. 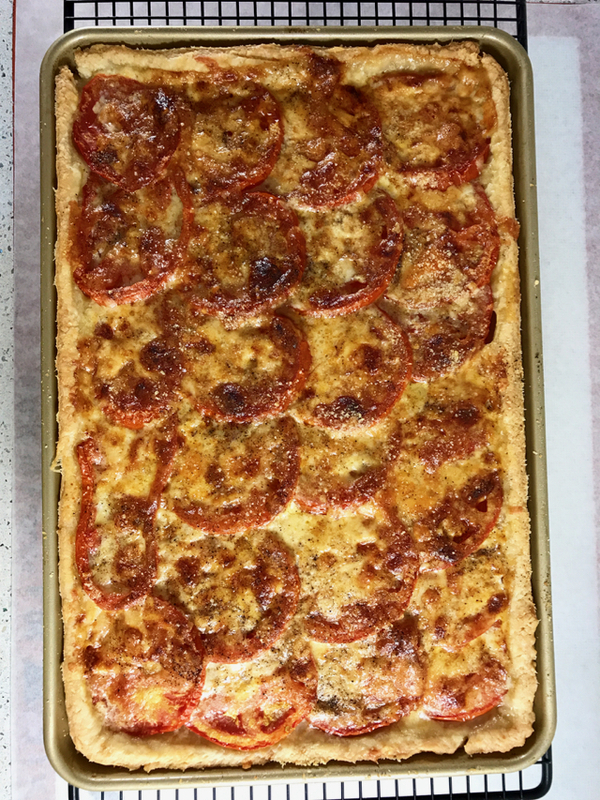 The tomato dish you see me preparing in the trailer above is a favorite from The Harvest Baker – Tomato Slab Pie. I sorta’ go tomato pie crazy when summer rolls around, so this recipe is just one of several you’ll find in The Harvest Baker. (My wife Bev says the Creamy Buffalo Chicken, Tomato, and Corn Pie on page 153 is the most delicious thing she’s ever put in her mouth. Just sayin’) One of the things I love most about the pie is the generous proportions: for essentially the same amount of work as a regular round pie, you can feed twelve people or more. Twelve very happy people, I should add. What to serve it with? Something summery, of course. How about sliced cucumbers vinaigrette? Or tabouli with lots of fresh mint and parsley? Watermelon slices for dessert? You’ve got this. I include two photos here: the one above was taken by me, the one below by Johnny Autry, the fellow who took so many of the stunning photos in The Harvest Baker. My thanks again to Johnny and his wife Charlotte for their great work. We still have a few openings left for our upcoming Lowcountry Pie Getaway in early October. This is a great opportunity to begin your pie making journey – we’ve had plenty of beginners attend previously – or up your pie game even if you’ve been baking pies for years. As in the past two years, we’re holding the Getaway in one of our country’s most beautiful and hospitable places, Charleston, South Carolina and in a fabulous kitchen facility like no other. Perhaps best of all, you’ll be able to share the fun and your pie passion with a bunch of great new friends. As I’ve said many times before, that’s my personal favorite thing about the weekend. Click here to find out more and to reserve your spot. PASTRY NOTE: This pie requires a double-crust batch of dough, or the Slab Pie Dough and shell you’ll find here. Prepare the slab pie shell as directed, then freeze until you're ready to proceed with the recipe. Preheat the oven to 400° when you're ready to start assembling the pie. Put one rack in the bottom of the oven, and position another in the middle. Using your finger, push most of the seeds out of each tomato half, but not quite all the seeds; you want the tomatoes to be a little juicy. 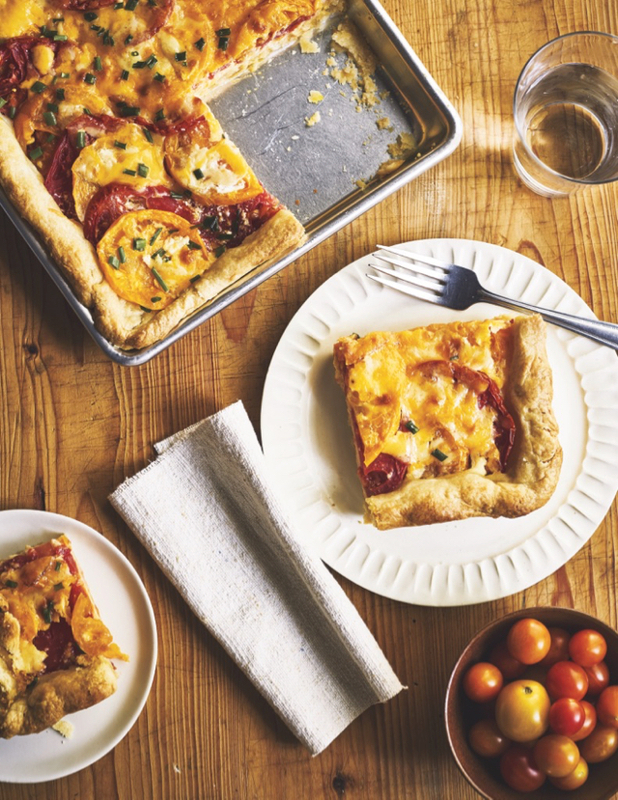 Cut the tomatoes into 1/8-inch-thick slices. Spoon the mustard into the pie shell. Using the back of the spoon, smear it over the entire bottom. Scatter half of the Cheddar evenly over the shell. Make two or three lengthwise rows of tomato slices in the shell. If your tomatoes are quite large, you'll only have room for two rows. Overlap them by quite a bit, so they form a thick tomato layer. Dice some of the extra slices and fill in any gaps between or outside the rows with these smaller chunks. Drizzle the heavy cream here and there over the tomatoes. Salt and pepper them liberally. Mix the Parmesan with the remaining Cheddar in a small bowl, and scatter the cheese over the top of the pie. Sprinkle on the chives and minced garlic. Bake the pie on the lower oven rack for 20 minutes. Then reduce the oven to 375°, move the pie to the middle rack, and bake for another 25 to 30 minutes, until quite bubbly and a deep golden brown. Transfer the pan to a cooling rack and cool for at least 20 to 30 minutes before slicing. If at any point in the baking you notice that the crust is puffing up a bit in a certain area, take a long skewer and poke through the filling and pastry. The bubble will immediately collapse. Refrigerate leftovers. Reheat slices on a baking sheet in a low oven for 10 to 15 minutes.